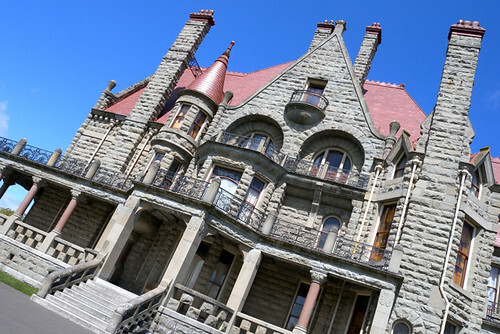 Craigdarroch Castle, legacy of the Dunsmuir family, has been perched overlooking Victoria since the turn of the 20th century. Nowadays its red spires are barely visible over the stretching Garry Oaks but it’s definitely a main attraction on many tours and personal trips to the capital city. The Dunsmuirs are pillars of BC’s industrial history and I’ve profiled them once before, in this post from 2009. 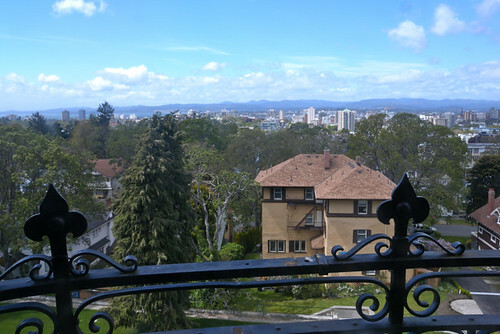 Aside from amassing real estate up and down the West Coast of North America, patriarch Robert Dunsmuir was a coal magnate and along with his wife Joan, had two sons and eight daughters. The family moved from Nanaimo to Victoria as Robert served as a Member of the Legislative Assembly around 1885. In 1887, the plans for Craigdarroch were being drawn. Unfortunately Robert passed away before the home was completed. Much to his son’s chagrin, Robert had left his entire empire to his wife, a move that was unprecedented in those days. 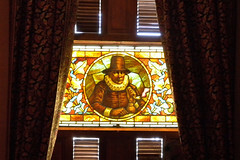 A sign in the castle’s sitting room states that in 1890, as the sole beneficiary of Robert’s estate, Joan herself had a net worth of $20 million. Around 1908, after Joan’s passing and years of turmoil between the siblings and their mother, the castle and its 28 acres of land were raffled off. The winners were Solomon Cameron and Parker Clarke although and Cameron’s brother then lived in the castle until his dead in 1917. Craigdarroch was extensively renovated by the Federal Department of Soldiers Civil Re-establishment (DSCR) prior to opening as a military hospital in September, 1919. From about 1921 to 1944 it was home to Victoria College and in 1929 it also housed the Victoria School Board. 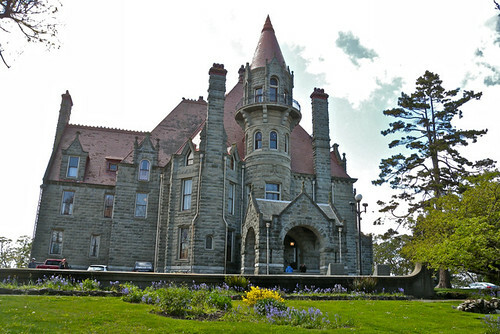 The Craigdarroch Castle Historical Museum Society took over the property in 1970. Craigdarroch is an amazing structure. 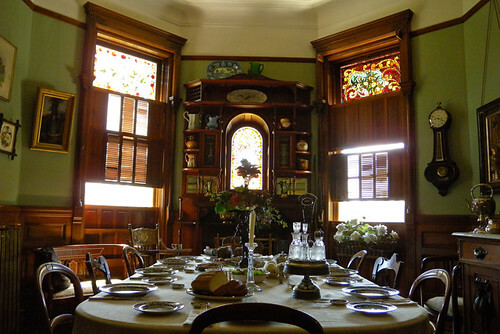 It is paneled with wood from floor to ceiling, and has countless rooms for sitting, sewing, smoking, dining, and playing games. 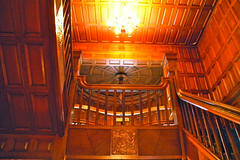 In the very top of the mansion, the attic is a grand ballroom with tributes to King George and featuring photos and dance cards from lavish balls that would be held on the grand dancefloor. When you arrive through the rounded door off Joan Crescent you’ll be asked to wipe off your shoes after you visit the reception desk. 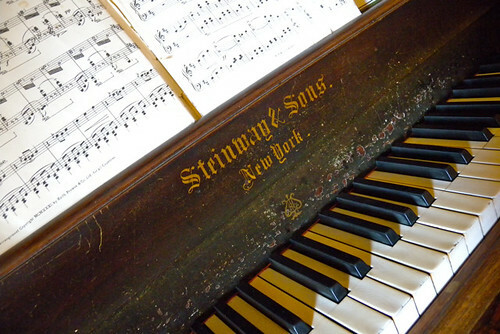 Admission is $13.75 for adults, $8.75 for students, and $5.00 for children (6 – 12). 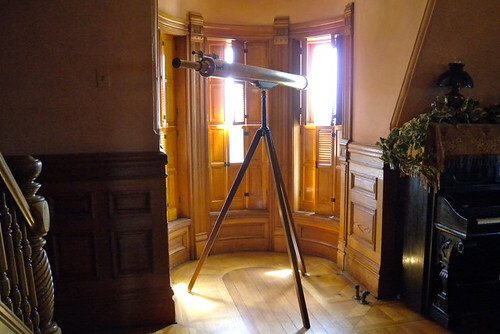 The self-guided tour loops you through each room of the house, up the first three floors to the ballroom and tower, then back down through the rooms on the other side of the house. My niece picked up the “I-spy” self-guided tour map and after a quick introduction at the bottom of the majestic staircase we were on our way. 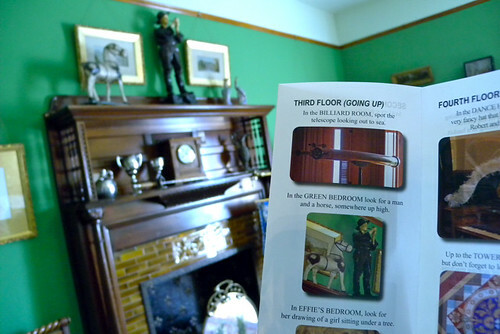 I was really impressed with the idea of the “I-spy” map, it featured close-up photos of items in each room that she would then have to locate as we made our way through the house. It was a scavenger hunt of sorts that kept her attention and enthusiasm going while learning about the history of Craigdarroch. 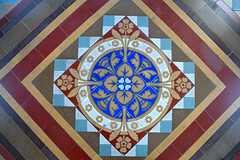 As you walk through the halls bathed in multi-coloured light from the stained glass windows you just get a sense of… wealth. 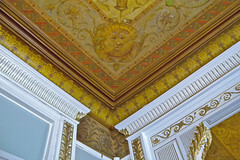 The luxurious carpets, carvings, paintings and furnishings are outstanding. There were also museum volunteers on each floor to help answer any questions or share tidbits of history with you along the way. It was helpful and they were all very friendly. You almost get completely caught up in vivid depictions of the 1890s until you turn a corner (where the kitchen once stood) and find a glittering gift shop. The exit leads you onto the back porch, looking out over the south lawn. 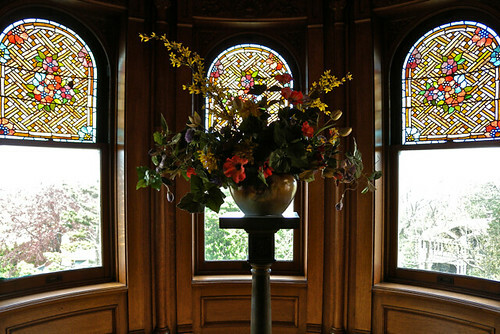 It’s worth taking a peek around the veranda as you can spot several stained glass windows, stone balconies, and curious doors that were not visible from the tour inside. Craigdarroch hosts events year-round including an outdoor theatre series on the south lawn in June. 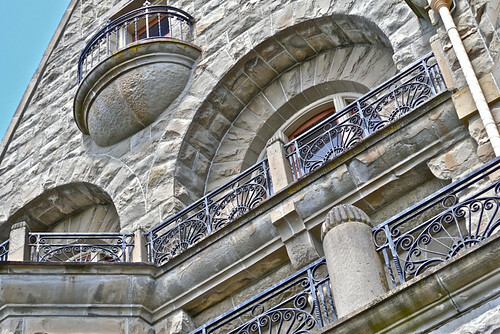 The next time you’re in Victoria it’s definitely worth checking out this National Historic Site and be sure your kids pick up the “I-spy” map so that they can play along and get a history lesson (without even realizing it). I could imagine myself living there! One of the houses we lived in while in Victoria had stairs that went up in our backyard, to the yard of the castle 🙂 It was fun to play among the trees on the castle’s property. How I miss living in Victoria.